It wasn't our intent to harvest honey. Our goal was to to get our legs back under us while making sure the bees' needs were met. It's been a year-and-a-half since we worked a hive, so a quick look-see/assessment — to stay ahead of the bees — was our plan. Unfortunately Marty did that – just yesterday – so there wasn't anything for us to do. It turns out, however, that he'd acquired another small hive (same design as ours) that we could work. So we did. 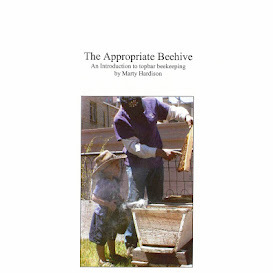 A hive in an outyard is so different from a hive in your own backyard. We wanted to make sure we were prepared for a variety of situations, as we aren't knowledgeable about the conditions where the hive is located. Has there been ample forage, making harvesting likely? Did it go desert dry in the 2 weeks since we were there? Or has the area seen rain that would make the bees feel crowded and grumpy? Both of us would really prefer the hive to be back in our own backyard but I'm just not ready to deal with the air traffic yet. So an outyard and trunkload of stuff it is. It took me hours to find the smoker (which we never use) to bring, just in case. Marty's got several hives in his apiary and maybe those bees aren't as nice as ours. We packed in water and a spray bottle (neither of which got used), suit/veil/gloves, and the comb box which contained 2 hive tools, extra top bars and a bee brush. I know bees hate bee brushes but I didn't want to have to look around for a good handful of long grass, so we could be in and out as quickly as possible. One of the bees let me know with in-my-ear buzzing, that she wasn't happy with what was going on. As the days grow shorter so do their tempers, so we closed up as soon as we'd swapped a primed top bar for a comb of honey. She stopped buzzing me before we even put the last top bar back in place. Not that I didn't trust my UltraBreeze, but it was much nicer after she relented. A quick look in the observation window of our hive let us know that the colony is on 15 combs, chaining off the 16th. I'd really like them to have several more combs come Labor Day but I really have no idea what progress they might make. Marty says the clover flow should produce a good crop then. We'll trust his word, but it's really weird trying to stay ahead of the bees, relying on another's knowledge. Just in case his prediction is off a little, we took the comb on-the-top-bar, and we can put it back if either hive is short for the winter.